Poly(allylamine), MW 15,000, 15% aq. soln. | Polysciences, Inc.
Poly(allylamine), MW 15000, 15% aq. soln. Ready to use Poly(allylamine) (PAA/PAH) 15% solution in water. 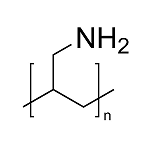 This is a water soluble cationic polymer with primary amino groups (free base types) for chemical reactions. Ability to modify surfaces and provide cationic character allows the user to selectively attract negatively charged functional groups to the coated surface or to the dissolved water soluble cationic polymers. Poly(allylamine hydrochloride), MW 150000, 40% aq. soln.